We believe that becoming a meaningful company to work in and becoming a company that our employees can take pride in is our duty as a Monozukuri enterprise. At the same time, Monozukuri, or manufacturing products, also means developing the individual. Therefore, we are constantly reviewing our workplace environment and have a diverse range of educational and training programs to help develop our employees. We value the fervor that our employees have towards Monozukuri, and we seek to run our business in sure and reliable way much like the way that gears mesh together. Achieving Monozukuri that is trusted by our customers is the dream of each of our employees and the reason why we work. 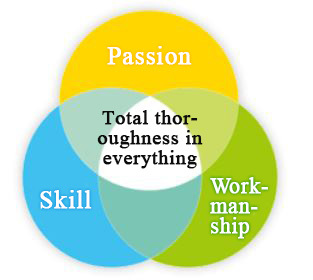 We are training our passion, improvement our skills, and working to improve our workmanship. We are thorough and we don’t miss the obvious things.